There is a place for efficiency in the government, and it does not solely depend on the leaders that facilitates the government processes, but it depends on every person governed. Governance is not provided not just by a certain group of officials because as society evolves, more actors and groups are now directly involved in the process of governance which are grouped into three legs, the government, the market, and the civic societies. (Carino, 2004) For a democracy to work as it is intended, power should not be confined in just a single person or a single group of people that are often the elites. Power should be distributed to every person in the society and it is up to the citizens to claim and practice that power for themselves. Governance is a term not used to relate to government processes only in the past few decades. We equate both terms, government and governance through basic definitions that we can find. From the root word govern, which simply denotes power and control over a system or territory. But Carino differentiated them by pointing that the government is all about control, while governance is all about management. Through this, one can easily say that governance is better than government, but we must also know that government is a vital part of governance. Aside from the role of the government, there are two other actors that work with it for effective governance, markets and civil societies. The market or the private sector generates wealth for dispersal and a barrack of human resource and talent. Businesses that both supply goods and services to consumers and wages to human resources that they employ. Civil society on the other hand represents the public and raise voices of those who have none or don’t know how to use theirs. Together, these three must work together and use their abilities to cooperate which will then provide success not just to the system itself but to society at large. Soup to Nuts (Center for Civic Education, 1977) is a very good cartoon that illustrates the advantage and disadvantage of having a government and the type of governance that a government employ. It shows that even if the market and civil society is independent from the government, they can still be affected by the kind of government it works at. In the filmstrip, the people on the city decided to hire a new despot that will oversee governing the city because the last government was elected by the people with a promise to be “out of people’s way” and gave all the control to the people themselves. It was chaos. This part of the filmstrip showed the importance of government not just in the distribution of resources, but also for maintaining order within the society. The people then decided to hire a new despot which made a huge turnaround for the better in the beginning but when the power shifted to just one person, too much control of not just the government but even control of the market through monopoly and control of society by imposing inhumane rules. This is also a good presentation that the government cannot just command or regulate its citizens, it can also mark them as adversaries to prevent alleged abuse(Weil, 2015). “Membership in participation, but not participation for participation’s sake” simply denotes that for one to claim and exercise power as a citizen in democracy, one should not just abide by the law and follow and leave it as it is. Besides, the power of the citizen doesn’t just start and end every election day where we chose our leaders, it should live with us every single day. From as simple as being aware of the news to organizing thoughts and collectively sharing those ideas to several people, one can really make a difference through many. Que, S. (2019). Government vs. Governance In the end we can see that whether we have different branches of governance, everything must work together to compliment and coordinate the other, and who should oversee it? The people, society. By actively participating in the governance of the state. By having a voice and letting it resonate. On Eric Liu’s Ted talk, he presented the six sources of power, most important of these in a democracy is the last source, Numbers (Liu, 2014). Through numbers, power can be shared from person to person and collectively, we can make our small voices enough to make difference. Carino, L. V. (2004). "The Concept of Governance". In From Government to Governance. Let me share this article I wrote and prepared as a graduate school requirement submitted last February 24, 2019. For me, compared to other subjects, the study of Social Studies is vital and will always be essential to the lives of people from as basic as their family lives and even beyond their communities and societies. First of all, as a person, we are a part of a larger state, which in fact, we are the most important component of it, that is why we need to be aware of what's happening from the smallest issues to the biggest news of our nation. Even at home, you will see the importance of Social Studies. You wake up in the morning, you will feel hunger, if you don't find anything to eat, that's when you realize that you need to work in order to survive, that's Economics. Secondly, once you leave your community, you'll find social studies' importance through the laws that you should abide to because you can't just say sorry for such actions, take note, ignorance of the law excuses no one. That's a big reason why we have to be updated with the law. Moreover, it is only through the social studies subject that you can relate and talk about the issues that are happening to our current society. You can be called a math genius but at the same time, be called socially ignorant because knowing basic math will make you survive but being ignorant to what is happening with your environment is a different thing. As per Aristotle, "Man by Nature is a Political Animal", it is our nature as human beings to be opinionated when it comes to issues that touches us personally. 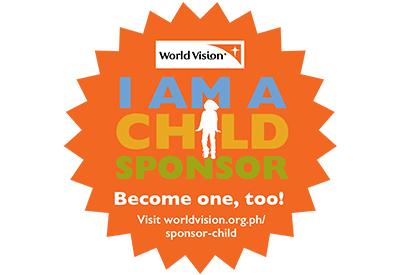 The price of goods, poverty, hunger- these are very important social aspects that are crucial to our existence that is why it is very important to learn "Araling Panlipunan". For some, a subject that is hard to understand and a sharp memory is needed but for me, it is plain and simple, whatever it is that you wish to know, that is that we are part of a state and a part of a society. As an English language teacher, what I know about Social Studies is only limited. Apart from knowing it as an integrated study of multiple fields of social science, I think what makes Social Studies a great body of knowledge to study by the learners is its rigorous and comprehensive content of various studies about human society and social relations. I think this subject, if applied in public schools, has to be well-inculcated to students in order to raise awareness how the present society affects an individual today. Social studies is a group of interdisciplinary fields that teaches students how to be an active and well-informed citizen of the society. As a subject area, it enhances the student's capability to examine how certain phenomena/situation can contribute to the society's development and at the same time, think of productive ways on how to respond and address a variety of societal problems. Thus, transforming them into proactive and vigilant citizens of our country. After reading the resources provided (Thornton, 2005) and (Saxe, 1991), and through the responses that I was able to gather, my understanding of Social Studies has been much propagated. Social Studies for me is both an aggregation and an integration of several subject matters that are not restricted to the social sciences such as history, geography, and economics to name a few, but also extends to how real-life problems that individuals face on everyday lives can be tackled through a set of skills that can be developed through this study. Though a good foundation on the social sciences can be much effective in understanding modern life, for Social Studies to be effective, it should relate these sciences as to how these future citizens take on such situations that require their critical thinking and confidence as a vital part of society. As per Mr. Japson's answer to the interview, we are all social beings and as a part of this state and society, we should be responsible in learning our duties and rights as citizens because we can only be as effective as much as we learn how to be effective and active. The role of Social Studies in the Education System is to promote a holistic well-being of the future individual. Training the minds of the child in Mathematics, Language, and Sciences are vital but as much as it is, we need to survive socially. Through interaction, we learn a lot of things, but how these interactions be explained to a student with regards to culture, norms, and even morals is what social studies are for. Beyond the knowledge that we get through drills and memorization, social studies go beyond survival as to "what people need in order to prosper in everyday life" (Thornton, 2005) The study of the past and the abstract concepts of spending, territories, citizenship, makes us more aware not just of the things that already happened to society but makes us understand why the things today are happening. The question is, does Social Studies present these aims effectively? As simple as the goal sounds, it is very difficult to deliver the subject since there are several factors presented by Thornton which I definitely agree on. These are the aims, subject matter, and student interest. For the aims to be achieved, the choice of subject matter must be carefully planned as to not just leaning towards the 'knowledge' of the social sciences, nor to the practical study of everyday lives. I believe that it should be a fair-play of both. A strong fortitude in the social sciences which will then be a strong shield to tackle present-time situations, and an understanding of the real-world so as to give the learners a reason to study and memorize and explore. And to achieve these aims through a well-balanced curriculum, student interest must be at the forefront because motivated learners are a key as to the success of learning. But can we ensure that learners will be intrinsically motivated just by a set of interesting curriculum activities? That we cannot say, for each individual has its own set of interests and we can only hope to measure them prior to designing the curriculum. To sum it all up, the importance of Social Studies goes way beyond just acquiring knowledge. As to what Lyanne and Madilyn has stated, it is inter-disciplinary and an integrated study which explains how wide its scope can be. Though in our Philippine Educational system, Social Studies or through our own version of Araling Panlipunan is catered to students for every year level, a systematic design not just of a year's worth of lesson is needed, but a structural design for the whole basic education is needed. During my years as an Elementary and High School students, I have experienced the use of different textbooks from different publishers almost every year. Though DepEd gives out standards to subject matter, the activities and extracurricular design of the study varies on every material, which makes it hard for students to see how systematic the subject can be or as to how continuity can be implored as a learned trudge the Social Studies experience year after year. All of these factors and more becomes a burden to the teachers. A burden which can be viewed as a massive opportunity through a structured curricular design, well planned selection of subject matter (and materials of course) and an effective execution of learning objectives inside the classroom and beyond. 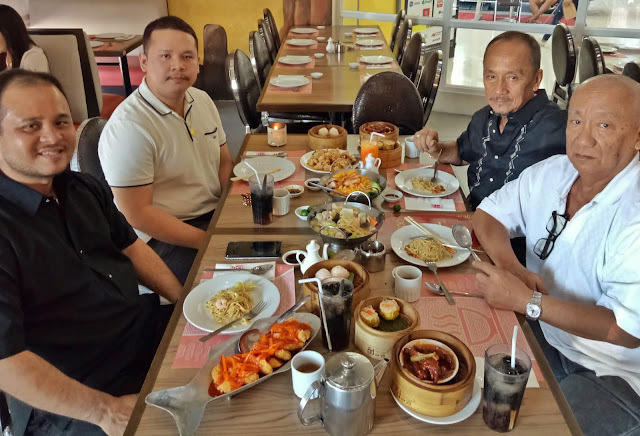 Cavite's Centennial road in the town of Kawit is starting to become a food hub for everybody since the Cavite Expressway opened a few years ago. 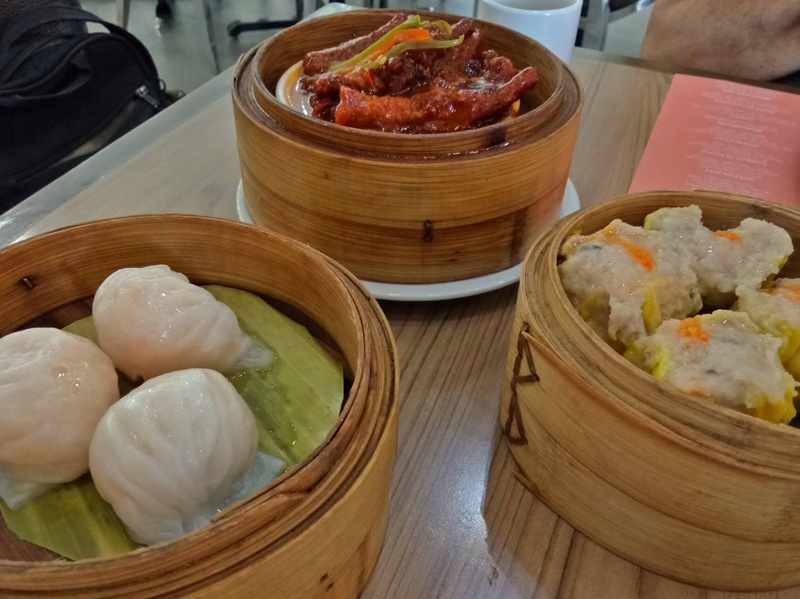 Restaurants and known fast food chains lined up the sides and one of these is the Manila based Luk Foo. Located at the Puregold building at the Lancaster side of the Kalayaan intersection, this Chinese restaurant offers dishes that are both delicious to the taste and enticing to the senses. Right after my uncle's funeral a couple of weeks ago, we decided to have late lunch at the Kawit area to avoid the rush hour traffic at the coastal road. It was me, my dad, my brother Wilson, and my uncle Carlito who had our delicious Chinese lunch that sunny afternoon. We decided to start with the dimsum menu, well anyone would right? Let me run you down with the dishes that we had on our lunch table. Bigger than the usual, but not as the big ones I had. You really would see big chunks of prawns but everything was made soft on the palette. 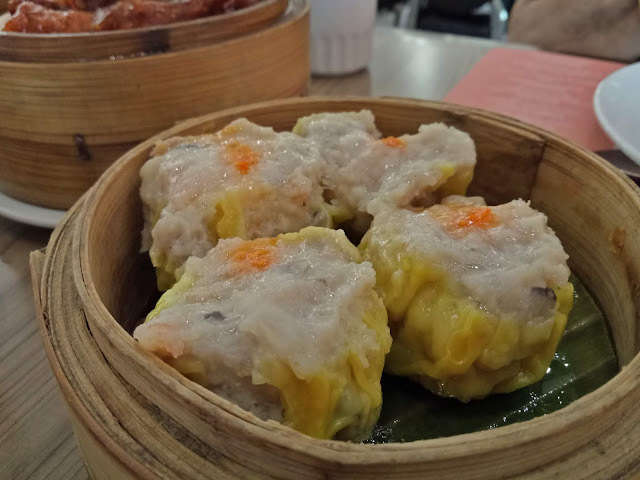 As a personal preference, I really like my siomai with bigger chunks of pork and not just the shrimp. Pork chunks give it more character and a special skill should be known as to how one could bind such chunks into a small cube of meaty goodness. Nothing special about this one. This one is something I like. 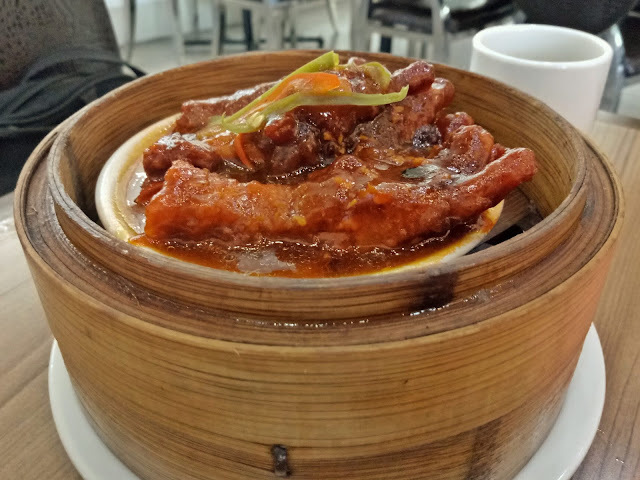 I'm not a fan of the tausi taste which is very rampant on chicken feet dishes, but what I like about this one is it is more on the sweeter side than the tausi side. It almost reminds me of a barbeque marinade flavor which is an absolute favorite taste for me. Thumbs up on this one. 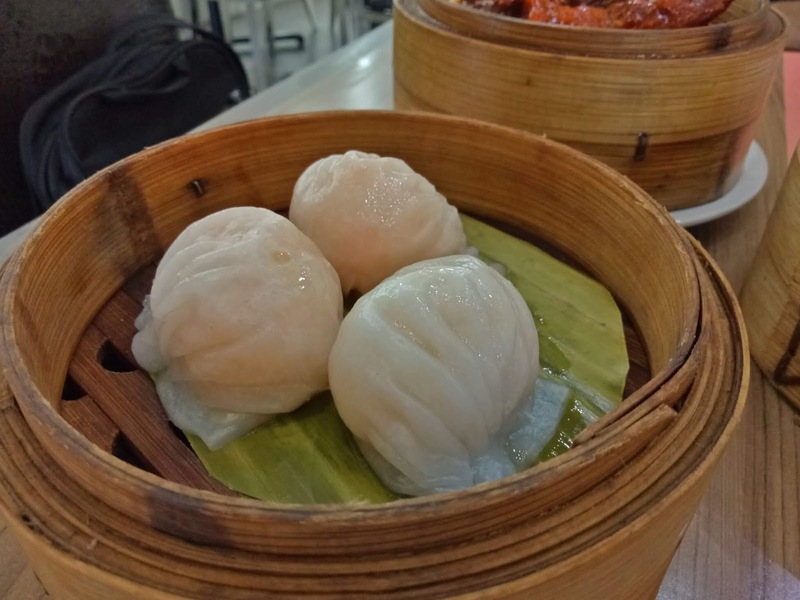 Hakao is another dumpling which unlike the siomai, does not have pork. To describe it, it's simply softened shrimp encased in a very soft, translucent wrapper (and I do mean very soft) and served hot and steaming. This is also the reason why I am very much intrigued with the size of their hakaw because it is way bigger than the usual hakao I see. I took a bite and then I realize that it is not the usual hakao. The shrimp was ground and I could swear there is some pork in there as well. It may be different from their siomai but this is not the hakao I would line up for. 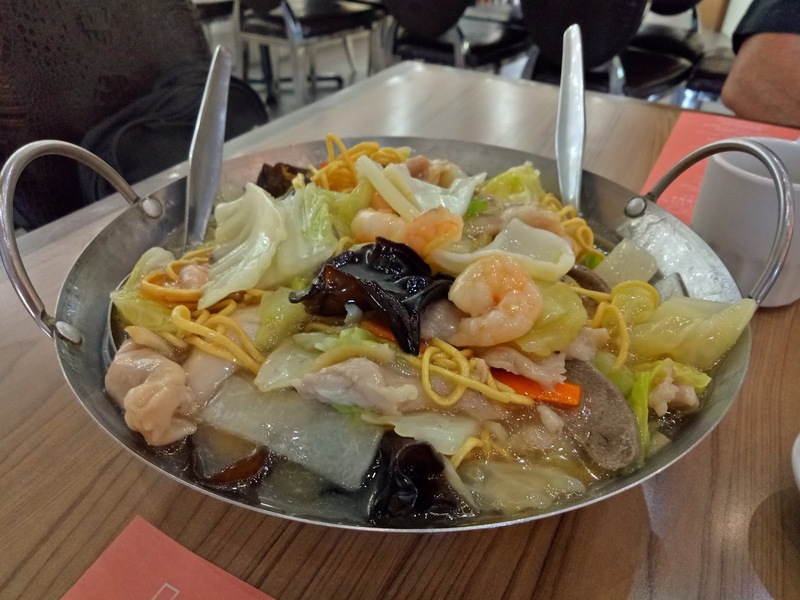 One of my staple dishes on any Chinese restaurant. Who likes soggy noodles right? So noodles served crispy, dunked under hot piping savory sauce makes its consistency perfectly tender yet still has that suppleness. This one is available in seafood or assorted meat. We got the mixed one so it had slices of pork, squid, prawns, and mushrooms. Another thumbs up dish for me goes to this fish fillet dish. Truly a fusion of sweet and sour, they did the perfect ratio of each of the two tastes. 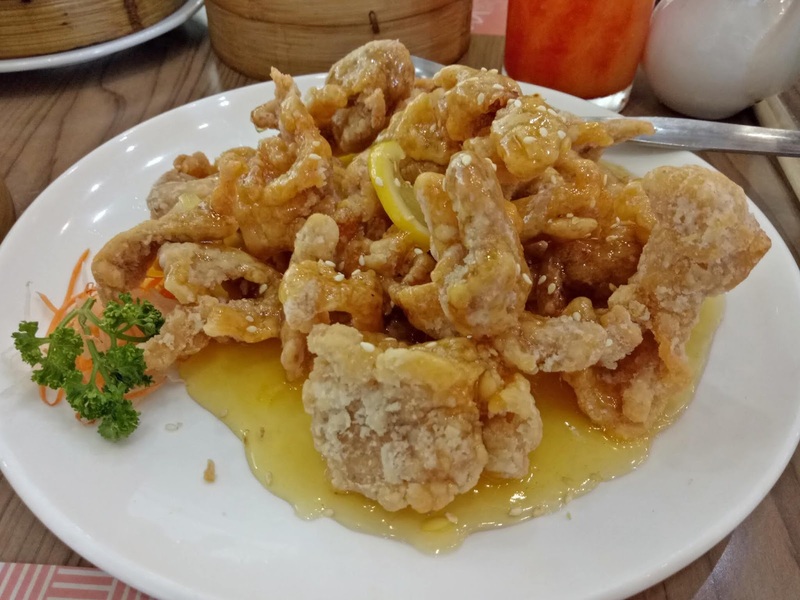 All the flavors that the sauces complemented the natural flavor that comes out of the fish that was first deep fried and then served with the sauce on top. 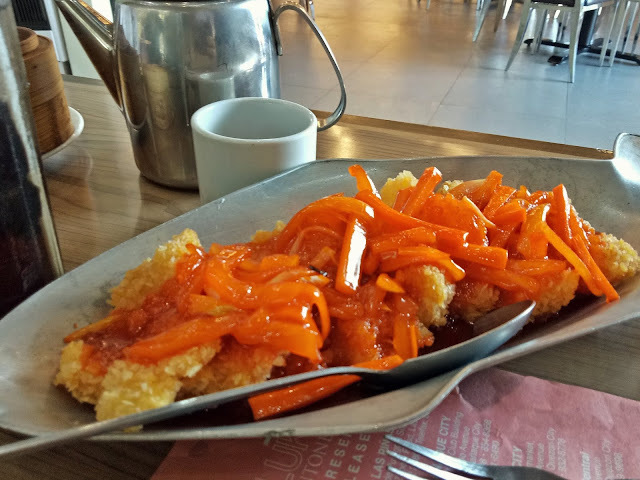 Some fish fillet dishes are served with the fish simmered with the sauce but having it fried first gives it modernity and I am sure that kids will not say no to it. Let me take you to a dish that you either hate or you love. Fried chicken strips under a sweet layer of lemon sauce is one of my favorites. The thing though about this dish is how perfect they combine the flavors of lemon and sugar. You can't be too lemony or else you'll serve up an acidic plate, or too sugary or it will taste like lemon drop candy. Luk Foo's was almost perfect but a little bit leaning to the candy area. I guess mixing white and brown sugar will do the trick, though the color then will be the issue. I'll leave this one to preference. 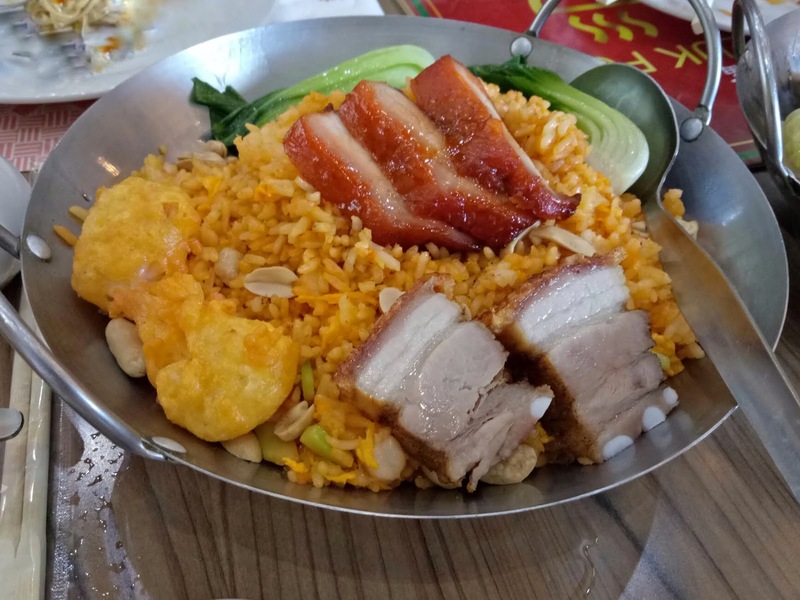 We had a choice between the usual Yang Chow and their house special fried rice. I asked my brother to opt for their house specialty just because we can't order that on another chain right? 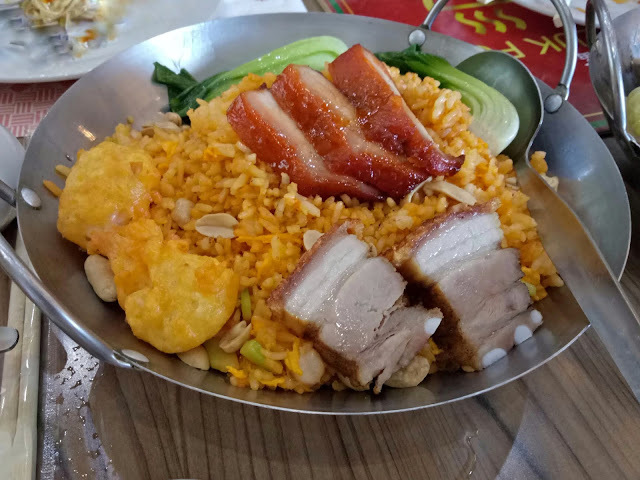 So it's the usual egg rice topped with lechon kawali (deep fried pork belly), slices of peking duck, salted egg crusted shrimp, and pieces of Bok Choi. I'm doing a keto diet at the moment but I did taste their rice, the taste of the eggs really wrapped every grain of rice which is a big requirement for fried rice, well for me, so this is a good one. We surely will miss our Uncle Asiong, my dad's younger brother. And we remembered his life that day and capped it with a hearty meal all for him. The place is well air-conditioned even under the scorching heat of a May afternoon so over-all, we did have a good dining experience. Will I go back to Luk Foo? I would say yes! But I would redo our whole order so I can get to taste other dishes that they serve, besides, they do have a long list on their menu.